Click image to enlarge Dallesport, Klickitat County, Washington. Image taken June 6, 2018. 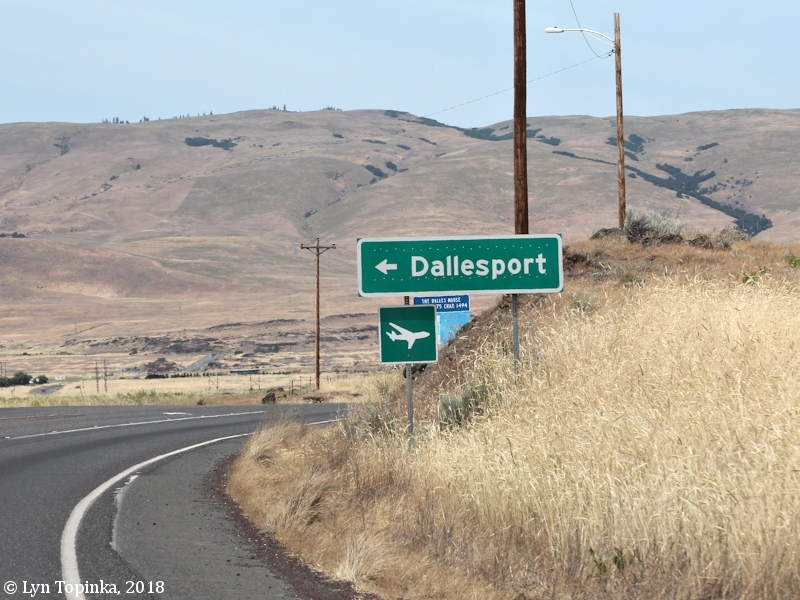 Dallesport is located on the Washington side of the Columbia River, across from The Dalles, Oregon, at approximately Columbia River Mile (RM) 189. Upstream is The Dalles Bridge and The Dalles Dam. Five miles upstream is Spearfish Lake. North of Dallesport on Washington Route 14 is the small community of Murdock. 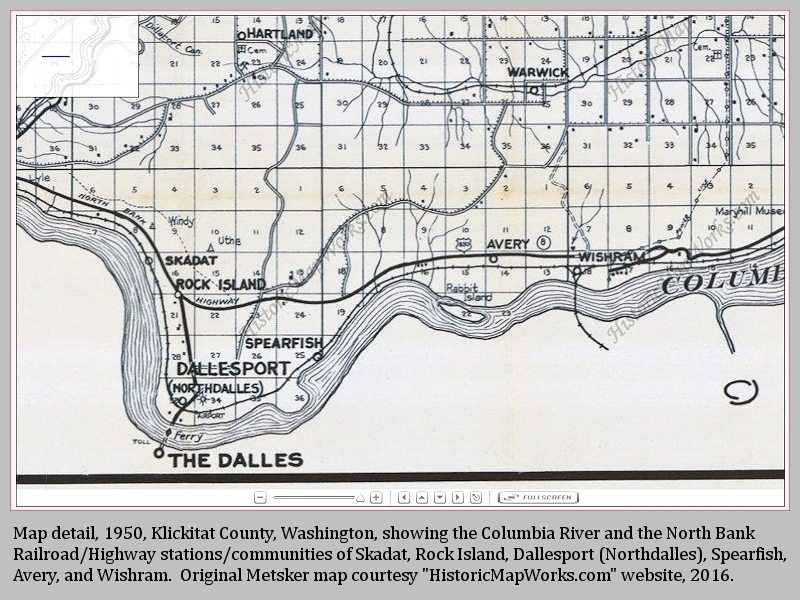 According to "Place Names of Washington" (Hitchman, 1985, Washington State Historical Society), Dallesport is a "town on north bank of Columbia River, opposite The Dalles, Oregon, southwest Klickitat County. Once it was a town of considerable importance, and the county seat of Klickitat County. In 1891, it boomed under the hand of Rev. Orson D. Taylor, a Baptist missionary. In 1895, he was arrested for gross misrepresentation, but was released on a technicality. 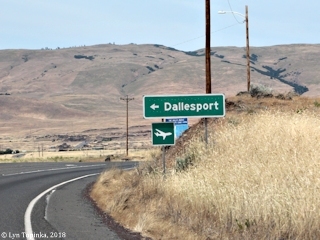 Dallesport is located in T2N, R13E, Sec.33, Klickitat County. 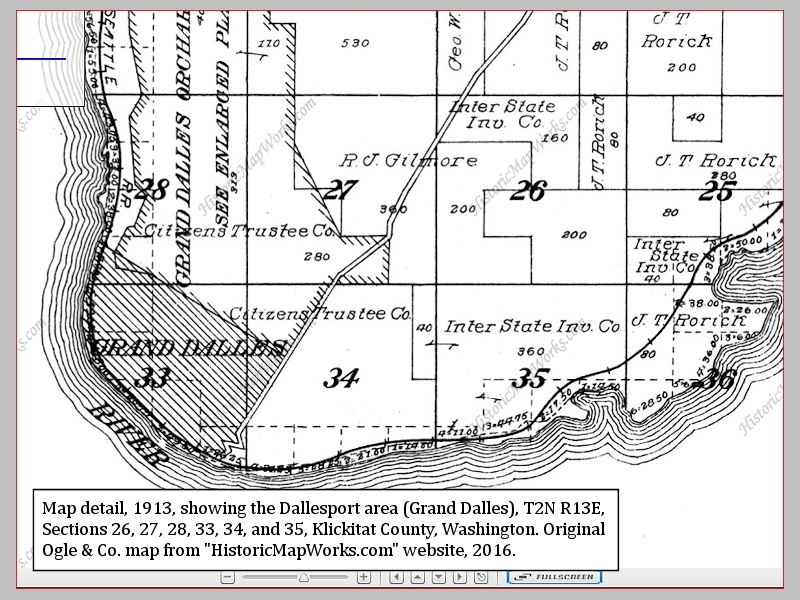 Today's Dallesport has had several names including "Rockland Flats", "Rockland", "Grand Dalles", and "North Dalles", before becoming "Dallesport" in 1937. 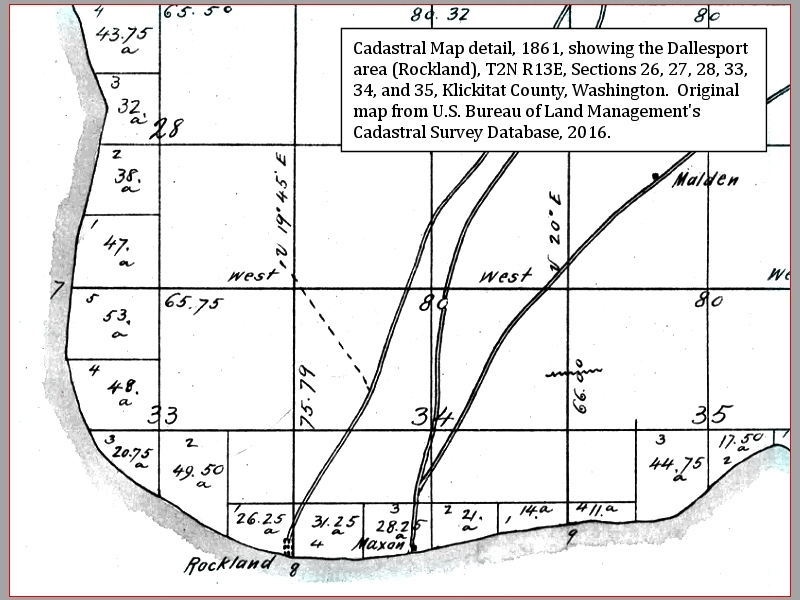 Click image to enlarge Cadastral map detail, 1861, T2N R13E, Sections 26, 27, 28, 33, 34, and 35, Dallesport area, Klickitat County, Washington. 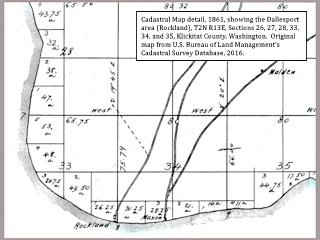 Original map courtesy U.S. Bureau of Land Managament, Cadastral Survey Database, 2016. Click image to enlarge Map detail, 1913, T2N R13E, Sections 26, 27, 28, 33, 34, and 35, Dallesport area, Klickitat County, Washington. Ogle & Co. original map courtesy "HistoricMapWorks.com" website, 2016. Click image to enlarge Map detail, 1934, T2N R13E, Sections 26, 27, 28, 33, 34, and 35, Dallesport area, Klickitat County, Washington. 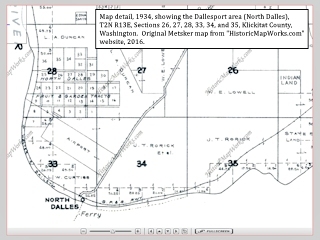 Metsker original map courtesy "HistoricMapWorks.com" website, 2016. Northdalles Residents Petition to Have District Termed Dallesport, Report Says. Word was received by The Sentinel the fore part of the week stating that Northdalles will be known as Dallesport after December 1. The short letter aroused considerable interest and a Sentinel staff member investigated further to find the how and why of the change. 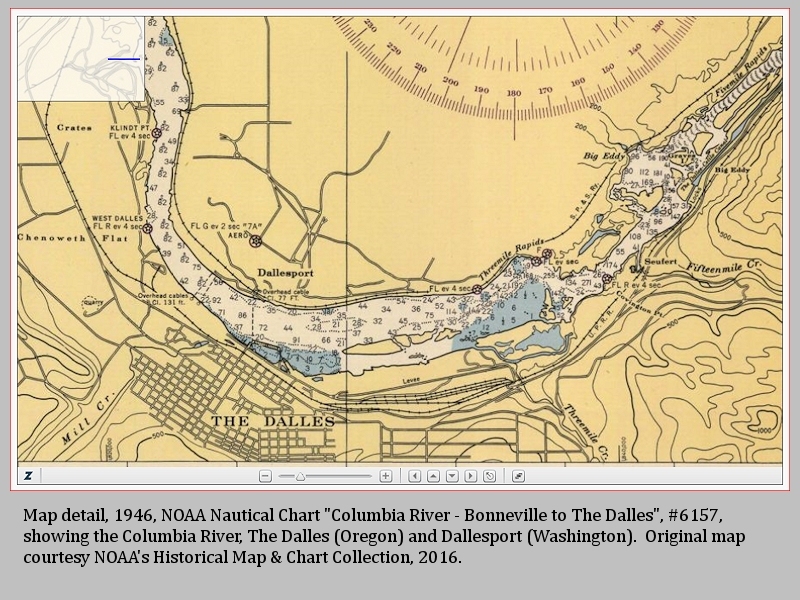 It was learned that a development which is now under way along the flats across the Columbia from The Dalles would point toward the time when an orderly laid out city would be thriving there. The man who is caring for the development recently met with those interested and suggested a change in name. He went further and suggested Dallesport to replace the more widely known Northdalles. The idea seemed to catch on and the suggestion was released in a quiet fashion. It was Mrs. Mann, the postmistress, who receives the actual credit for the change, The Sentinel learned. She circulated the petition for a change. A percentage, thought to be 60, of the patrons of the post office must acquiesce if the name is to be changed. The names were obtained with little effort a few weeks ago and the petition forwarded to the federal authorities. The answer back was favorable and Mrs. Mann sent out her official announcements this week. 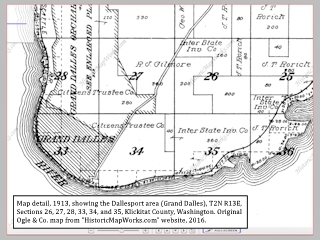 The area was originally known as Grand Dalles, later as Northdalles, and after December 1 will appear on the official records as Dallesport. Source: "The Goldendale Sentinel", November 25, 1937, courtesy "rootsweb.com" website, 2016. 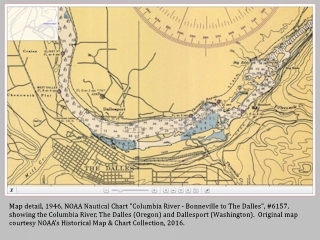 Click image to enlarge NOAA Chart #6157 detail, The Dalles (Oregon) and Dallesport (Washington). Original map courtesy NOAA's Historical Map & Chart Collection, 2016. Click image to enlarge Map detail, 1950 Klickitat County, Washington, showing the Columbia River and the North Bank Railroad. Also showing the communities of Skadat, Rock Island, Dallesport (Northdalles), Spearfish, Avery, and Wishram. 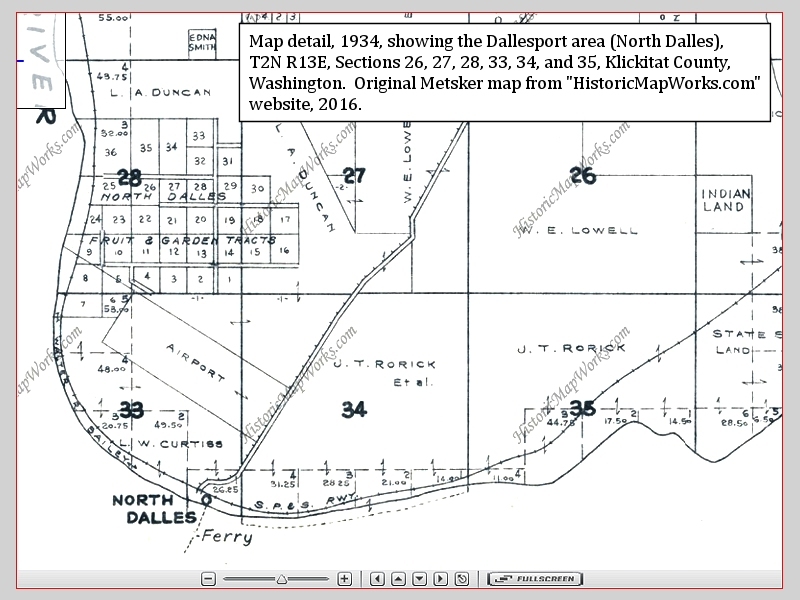 Original Metsker map courtesy "HistoricMapWorks.com" website, 2016.